Everton's motto is "Nil Satis Nisi Optimum" which means: "Nothing but the best is good enough." The motto is at the heart of all aspects of the Football Club and is central to their Academy Program. Everton Football Club operates an extensive and highly successful Youth Academy. Players such as David Unsworth, Tony Hibbert, Francis Jeffers, Leon Osman, James Vaughan, and of course Wayne Rooney have graduated through the youth system. The Club is fully committed to the Academy and recognizes the importance of developing youth. The Everton Academy Coaches will be over for 2 weeks. Camps will be conducted by Everton Academy Coaches and will be held at Strkers Soccer Center. 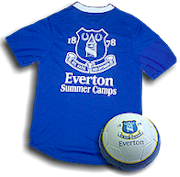 The Camp Fee includes - Everton Football Club tee shirt, Everton soccer ball, a Male MVP of the Week prize, and a Female MVP of the Week prize. Players are to BRING A LUNCH. Early drop off available at 8:30 AM. Latest Pickup at 6:00 PM. These are 5 day camps from 9:00 AM - 5:00 PM. Each day will offer the highest coaching and development opportunity in this area for players. Players will be broken into groups based on age and skill level. Camps will be conducted by Everton Academy Coaches.